It’s Al Capone, Betty White, and Andy Kaufman’s birthday. 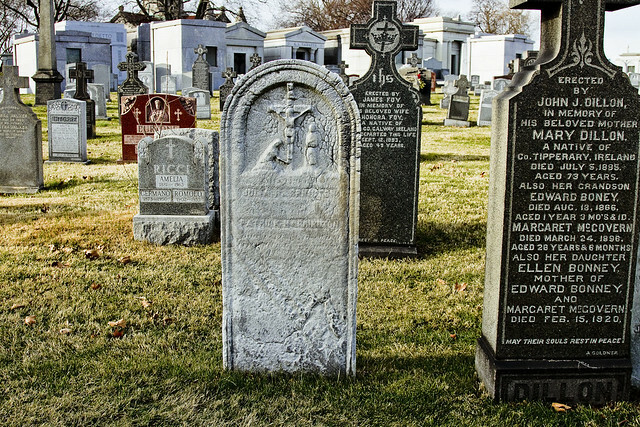 Over in LIC’s Blissville neighborhood, you’ll find the principal burying grounds of the Roman Catholic Church in 19th and early 20th century NYC, called First Calvary Cemetery. It’s called “First” Calvary, as there are three other properties found to the east in Woodside that the church refers to as “Second,” “Third,” and “Fourth.” First, or Old, Calvary has been in use since 1848. 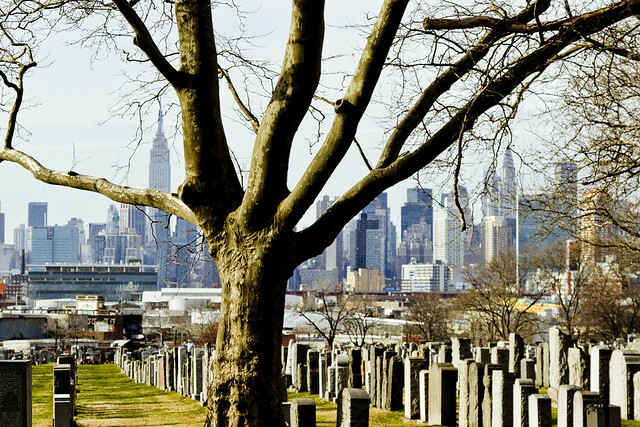 Calvary Cemetery is on a hill overlooking the Newtown Creek and is surrounded by the industrial zones of Long Island City and West Maspeth. 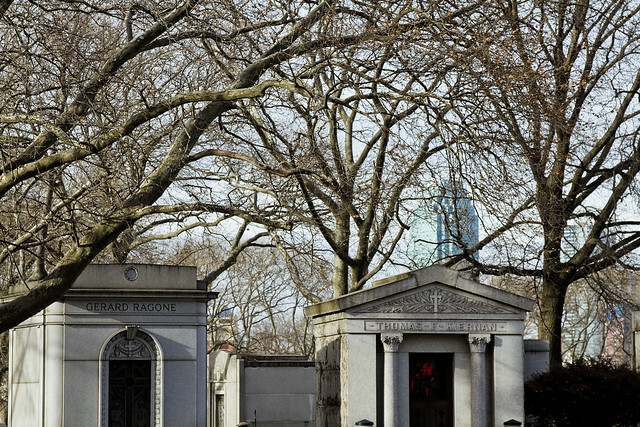 The majority of burials in First Calvary occurred between its founding and the Second World War, which means that the monuments found within its fence lines have endured the effects of the endemic atmospheric pollution typical of industrial America prior to the passing of the 1972 Federal Clean Air Act. Acid rain wasn’t a term used prior to that legislation. Granite seems to be the best choice for a monument able to weather the atmospherics hereabouts. Marble rots away, obscuring the legend, iconography, and screed carven into the memorial stones. If you were to run your fingers across the surface of the stone pictured above, a sandy grit would transfer from it to your skin. To be fair, though, there used to be an acid factory right across the street from Calvary Cemetery. That factory was opened in 1866, and was first known as “General Chemical,” then as “Nichols Chemical,” and then as “Phelps Dodge.” Phelps Dodge, of course, is one of the named “potentially responsible parties” or “PRP’s” in the ongoing Federal Superfund situation on Newtown Creek being investigated by the Environmental Protection Agency. Phelps Dodge vacated its property long ago. Back in 1901, when the corporate entity was still called the Nichols Chemical Company, community complaints and a law suit by the cemetery forced them to build what was – at the time – the largest chimney in the United States to release their acidic waste gases high above the ground. It was supported by wooden piles driven into the landfilled Newtown Creek marshlands their factory was built on. These piles supported a 25 foot deep concrete foundation, which in turn provided a stable enough base for a 22,000 ton, 367 feet tall chimney. Roughly translating that to modern day “building stories,” this was a 36-37 story tall chimney. For comparison, the sapphire megalith of Long Island City is 53 stories in height, but three of those stories are below the ground. The Nichols/Phelps complex employed close to 1,500 people back in 1901. The acid factory was merely part of their production line, and the high grade sulfuric acid they were known for as a mere co-product for their true profit center. The main focus of their business was the refining of copper. The company was producing some 517,000 tons of the stuff, annually, back in 1901 when that chimney went up. Most of the landfill that the company had used to build out the marshy shoreline of Newtown Creek, and upon which they built their factories, was material harvested from the refining processes – specifically slag from their redoubts and furnaces. The original shoreline of Newtown Creek was anywhere from 500-1,000 feet back from the modern shoreline, more or less where the Long Island Railroad’s Lower Montauk Branch tracks are found today. Just curious, Mitch. Have you made any concrete plans for the disposal of your mortal remains when you shuffle off this mortal coil? How ’bout a cremation on a boat a la Viking style in the middle of the Creek? 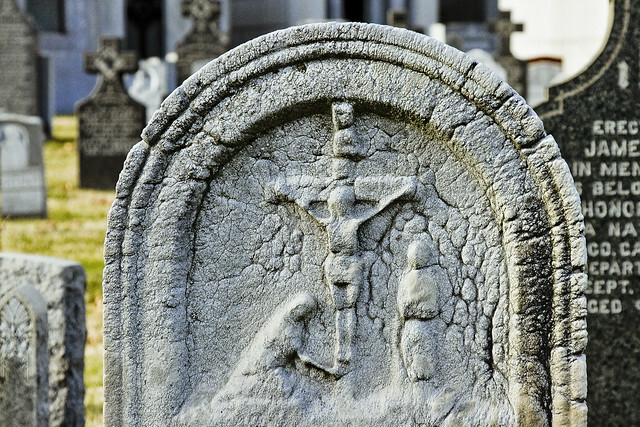 As we all know from the absolute fact, unquestionable settled science department, acid rain from chemical companies would have caused all headstones in Calvary to dissolve were it not for the heroic efforts of a government bureaucracy as all non-governmentally approved private sector human activity is the vile work of Satan himself. Everybody knows all water in nature everywhere on earth has a perfectly neutral PH balance except for human activity, all types of stone have the exact same hardness and weathering could never cause erosion in stone. Before the advent of the EPA, zillions of people were dying every day from being poisoned by dirty air and water, all things made of stone were liquefying and cats and dogs were living together. A time of apocalyptic butchery and mirth I tell you. Thank God or Gaia the EPA is from The Government and they’re here to help. Everybody except of course the capitalist industrialists who tittered manically as they killed people with their industrial processes (that didn’t do anything to improve our living standards or lives in any way) and dissolved stones with acid rain more caustic than xenomorph’s blood while surreptitiously breathing from secret cans of air hidden in their closets ala Spaceballs as to not breath the air they poisoned. I mean they’re just like two-dimensional cardboard cutout villains from a Victorian melodrama, except in 3 fleshy dimensions, so of course they want to destroy the whole planet and kill everybody all the while somehow making obscene profits on a lifeless planet. And if I were to gainsay you on all the above points I’d be a double weenie science denying heretic bad person. Maybe even guilty of witchcraft, racisim and being uncool too. No, can’t have that so accept my humble amen. I’m sure you can cite many scholarly articles written before the industrial revolution (from the stone age even as the science of geology is as old as the hills) detailing the rate of natural erosion of stone observed then to compare with erosion rates today and have seen the closets of canned air so I won’t even ask how you can be so sure as you have written ex-cathedra. I simply read this post all the while smiling and nodding in agreement. Bravo sir, my compliments as I am now enlightened and edified. Actually – the chimney was a result of a lawsuit by other capitalists (farmers, anybody who had iron based equipment stored out of doors), and the church, against the Nichols people for the effect that their effluents were having on other operations in the area. The Nichols people’s response included the creation of a vegetable garden at the top of Berlin Hill to demonstrate the efficacy of the new venting system. Stop politicizing or filtering things through your modern day political POV. Not all government is bad, not all capitalist activity is good. Also, acid rain is a real thing, don’t pretend it’s some Potemkin village drummed up by environmentalists. What is wrong with an industrial power taking steps to reduce their environmental impact? You’re just being contrary for the sake of it. Thank you Mitch for the toxic info on the Newtown Creek. I think it has Superfund designation. Regards, Ron on Apollo St.